Combine tuna, mayonnaise, red onion, lemon juice and zest in a bowl and mix well. 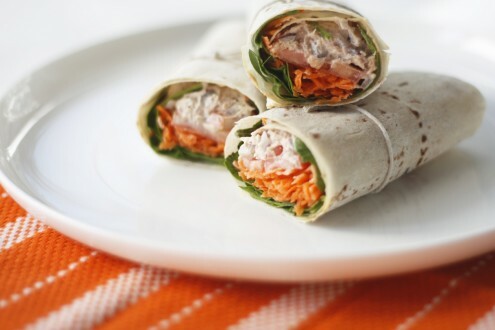 Put a handful of spinach leaves, some carrot and several slices of tomato in the centre of each wrap. Place an eighth of tuna mix on top. Fold in edges and place on plate. Repeat for each wrap. This looks so simple but so yummy – great idea adding the lemon. Tasty light lunch, friends loved it. Thanks Betty, glad you liked it. Delightful! I tried this with tinned salmon and capers too. Also yum.